The volatility continues at the CME in the hog markets. 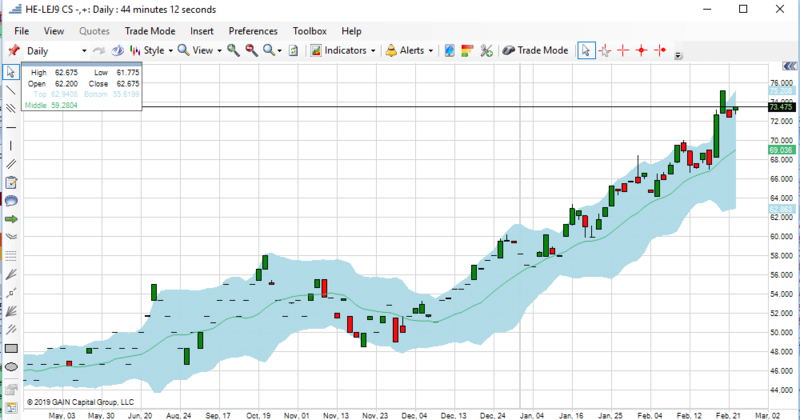 For what feels like the 10th week in a row, front month hogs saw limit moves in both directions. We suffered through an ugly draw down mid week only to see the board close near highs. You just can’t be in position to let this market shake you out, which is why we hesitate to add too much leverage to our June position. 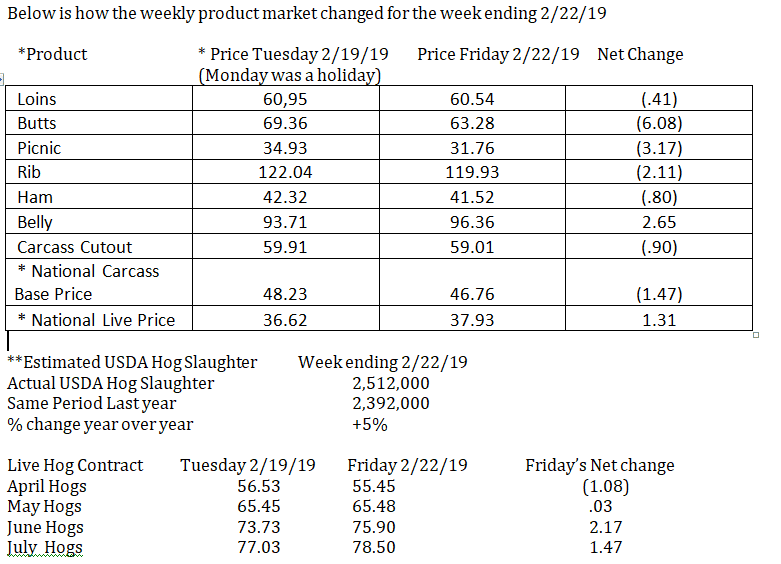 Slaughter last week held above 2.5 million which isn’t supportive for the product market, but we think that should change soon. Traders are beginning to move away from the June contract to play the ASF story and putting money in the back ½ of the year. We don’t blame them for doing so but caution this as a long term strategy could end badly as the US market has not faced heavy liquidation yet, which could come in the early fall time frame. We like staying long the earlier contracts for quick moves and possibly selling the back end against it. One quick note, at some point in the next few weeks we may look at spreading some April pigs against April cattle. At 75-76 that April Cattle-Hog spread should be shorted. We are approaching a front month record when looking at ratio prices. If you are aggressive, be ready and jump in if last weeks highs are tested. This wont be an official rec as we don’t really want to get into cattle trading but this is an opportunity we wanted to let you know about. As of this writing it appears that the product market has bottomed and that the next major move on retail and processed cuts will be higher. The chart below shows that loins and butts have lost value last week, which is now a trend. We think the slaughters are going to start to slow this next week, which should help these cuts bottom and the front month futures put in a short term bottom. The same can be said for the hams although weekly slaughter shortens up hams probably won’t move higher. Bellies should appreciate in price and could go back up to the 115- 120 area. This is consistent with the feature interest we have heard from our sources they are seeing for the first two weeks in March. 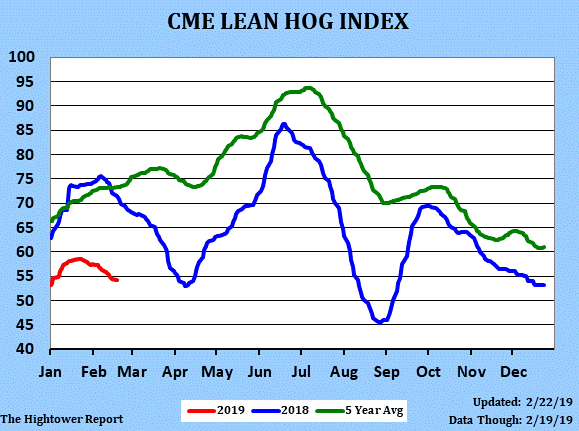 Our sources also tell us that the hog numbers out front are starting to decrease, and this will help facilitate an increase in pork product prices as well. 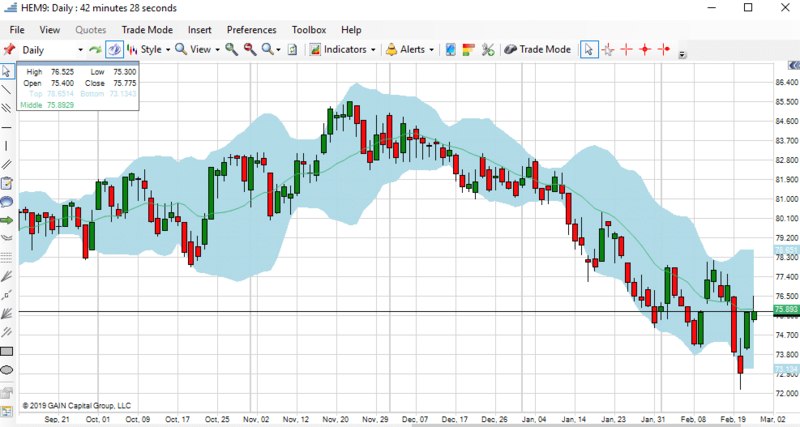 We mentioned in last week’s news letter that we wanted to buy LHM on hard breaks. Be ready to jump in as we think the bottom is near. We are hesitant to get the folks who follow the newsletter verbatim over leveraged, if you are doing this on your accord and don’t mind the leverage, look to add another unit. We will follow at some point. You can also start looking at April as well, but be careful to not get long at a price where you can’t handle a 2-3 dollar move against you. Given that we think that the product market has most likely bottomed, we believe think April can make a run at 60.00. Any break in the summer hogs, we believe can be bought, be it ever so ‘lightly.’ After all this is only February. Again, be patient and don’t get spooked on breaks. Watch the interior Iowa live hog weights. They should stay steady for the next several weeks then start down as we approach the spring planting season. As usual keep watch of the weather forecasts for the Corn Belt and be prepared to adjust your positions accordingly. Its early to worry too much but the Ag forum balance sheets pointed toward some aggressive price action this summer on weather problems. Pay close attention to you Agriculture Industry news services for any progress between the US and China. The deadline for the next round of tariffs is next Friday March 1, all sounds good right now but you have to take the rhetoric at face value.